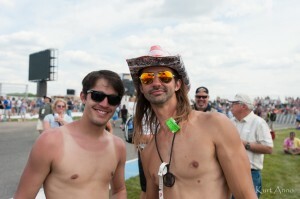 Carb Day at the Indianapolis 500 is a long running tradition that takes place on Friday before the Indy 500. Originally slated as the last day of practice for race entrants, the tradition has evolved into a day-long party capped off by a concert. This year’s lineup consisted of O.A.R., .38 Special and Jane’s Addiction. An enormous stage was set up in between the 3rd and 4th turn of the massive Motor Speedway. Referred to as the “Snake Pit”, the area between the turns was packed as the crowd was primed for some good Rock and Roll.